Part 1 is here. Here we go with part 2. Emerald Pool. This small lake (less than an acre) lies between Nevada Fall and Vernal Fall. In the late summer, when the Merced River carries a tiny fraction of the water it does in the spring, it can be quite benign. At other times it is one of the most deadly spots in the park. The National Park Service prohibits anyone from swimming in the pool because it is less than one hundred yards from the brink of Vernal Fall. Although there have been several fatalities over the years, this is also the spot where the only successful river rescue took place that cost the life of the rescuer. In 1997, Arjuna Babapulle saved his wife, after she slipped into the Emerald Pool, but at the cost of his own life. 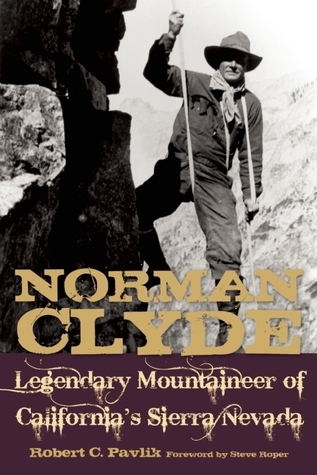 He was posthumously awarded the Carnegie Hero award. Liberty Cap on the left, Nevada Fall on the right. Nevada Fall. Sequestered in the heart of the Sierra Nevada, and arguably the most exquisite water feature within the range, Nevada Fall deserves to share the name of the larger Range of Light. The Native American name was Yo-wai-we. 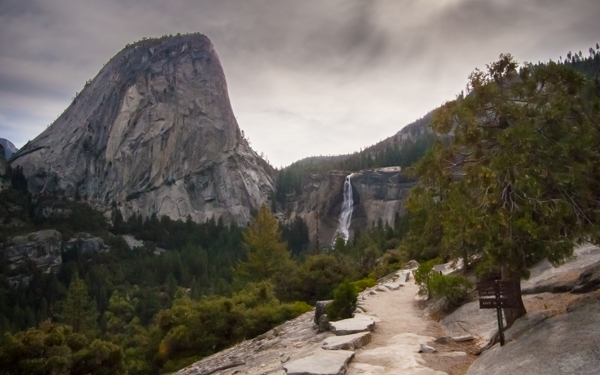 The fall is 594 feet high, less than a quarter of the height of Yosemite Falls. Liberty Cap. This striking granite dome was formerly named Mount Frances, Gwin’s Peak, Bellow’s Butte, and Mount Broderick. 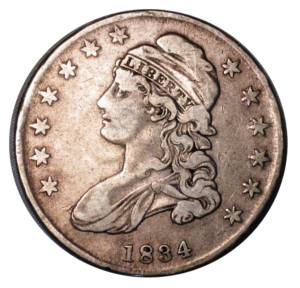 In 1865, however, California Governor Leland Stanford declared that the shape of the dome reminded him of Lady Liberty on the half dollar. The name stuck. Half Dome. Half Dome is probably the terrain feature most associated with Yosemite. In the excellent Shattered Air, Bob Madgic makes the case that it should more properly be called eighty-percent dome, but that name isn’t as poetic. The native name was Tissaack, and referred to a woman who was transformed into the mountain. 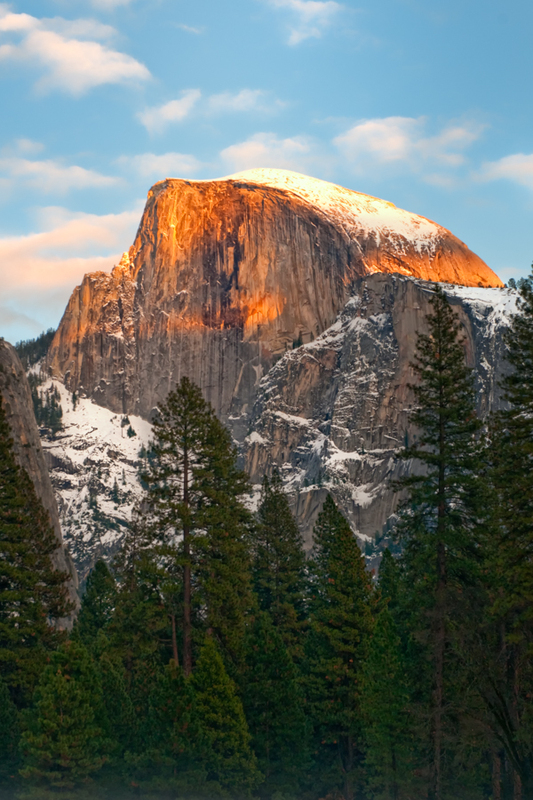 The first ascent of Half Dome took place in 1875. Tressider Peak. 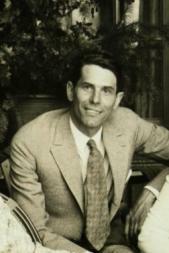 Donald B. Tressider was the president of the Yosemite Park & Curry Company (and was the husband of Mary Curry). 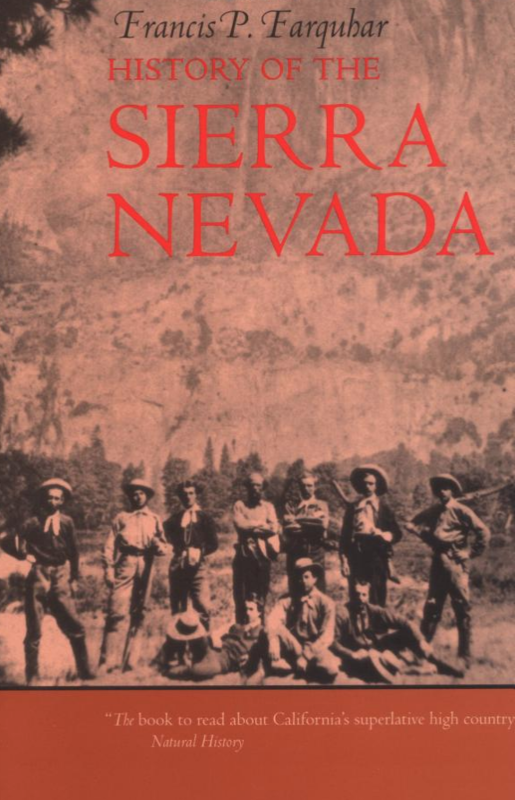 Among his many contributions to the park was the Ahwahnee Hotel, the Badger Pass ski area, and the High Sierra Camps. He was also the president of Stanford University. 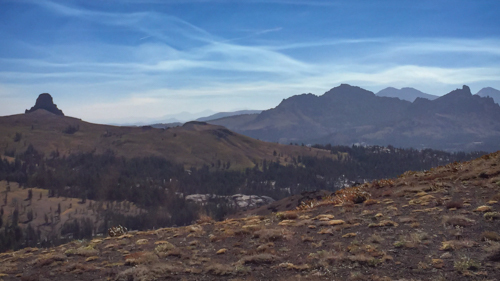 We will continue to work our way towards Tuolumne Meadows next week. 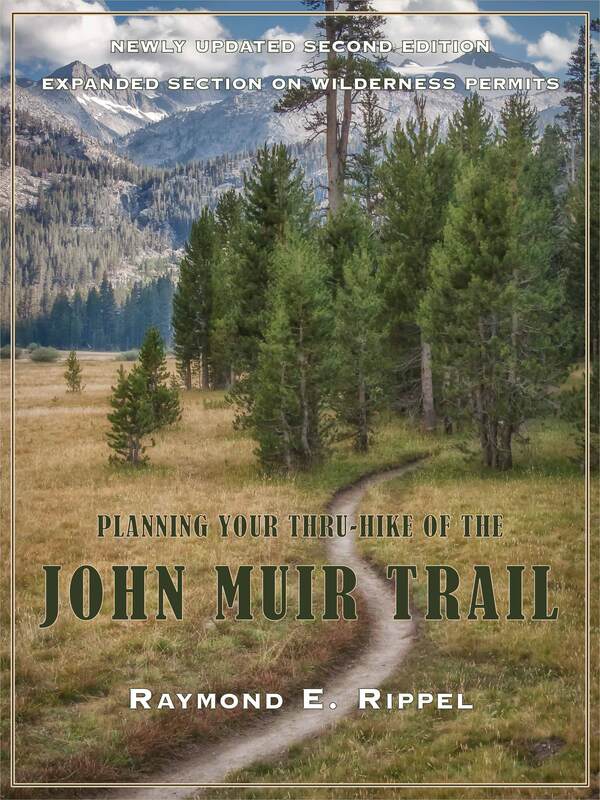 Last week I described what I consider the perfect alternative to the John Muir Trail for those who cannot get the two or three weeks off, who cannot get a wilderness permit, or for those who would like a one-fifth scale model of the 211-mile JMT to use as a training hike. This week I’ll provide a photo-heavy trip report, and next week I’ll discuss campsite strategies. 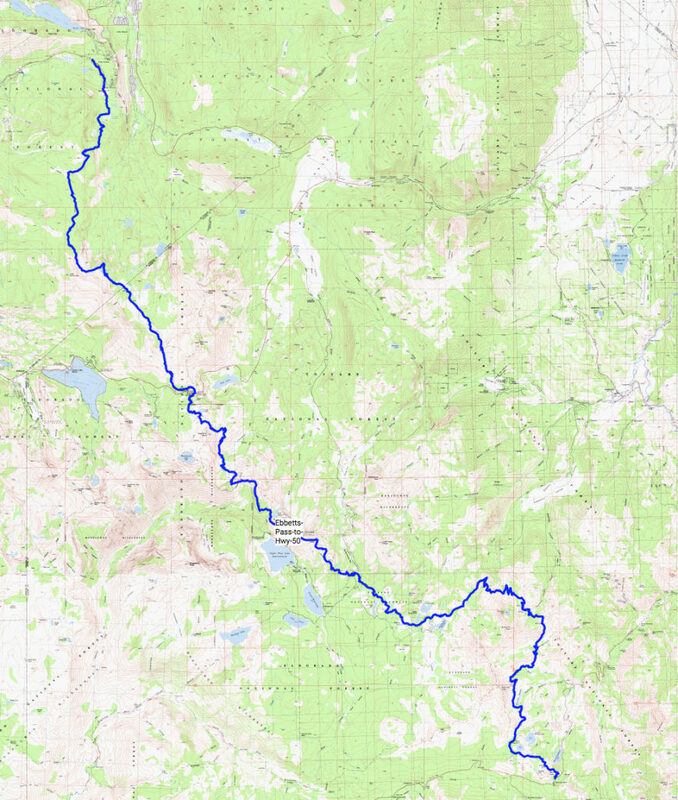 If you hike these 43 miles northbound, as I recommend (see the far right of the profile, above, for the reason for starting at the left side), you will begin at the PCT trailhead off Highway 4 near Ebbetts Pass. It doesn’t take long for the scenery to get good. Within the first few miles you will pass Kinney Lake. 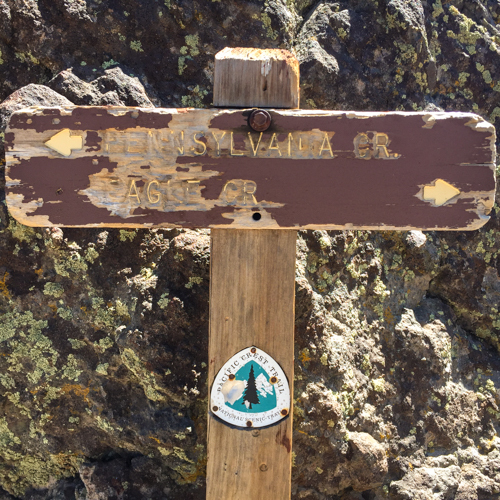 Although it’s too early in the hike to look for campsites, there is a open granite bench just down from this sign that is a great spot for a short break and a snack. A few minutes later you can look back at Kinney Lake from above. During the first few miles there are enough trees to provide shade during most of the day, and the trail compacted dirt (my favorite). Eventually you break out into more open terrain and the rock formations, much different than you would see in the southern Sierra, become prominent. The first day (assuming you are going to take three to three-and-a-half days for the entire hike) is rolling, but neither the ascents nor descents are extreme. All in all it’s a great way to spend day one in the woods. I took my first break, and had second-breakfast, at a saddle between Pennsylvania Creek and Eagle Creek. Pennsylvania Creek was flowing nicely, and that is where I topped off with water for the first time since entering the wilderness. Eagle Creek was dry. Once you leave this spot the ups and downs start to get just a little steeper, and there is far less shade. For those of you interested in cell coverage, you should know that it is very poor throughout the hike. The only exception is when you reach the highest ground, like this spot with a view of Carson Valley in the distance. 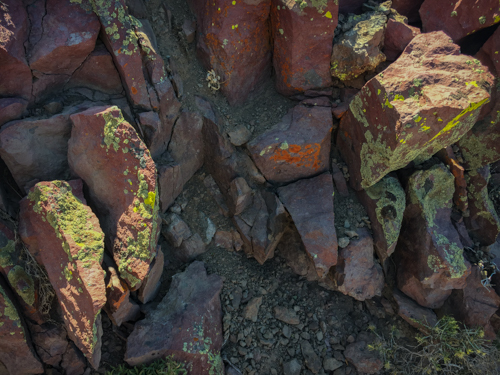 Don’t just enjoy the expansive landscapes; also take the time to admire the smaller views, like this orange and green lichen growing in the deep red rocks. Day two is mostly climbing, but at least it starts out shaded. I found the first few hours of this second day really enjoyable, as I spent most of that time steadily climbing through forested terrain. Look for deer, Steller’s Jays, and day hikers coming in from Tamarack Lake. Eventually you break out into open terrain again and continue your climb. The vistas are amazing! If someone were to show me the photo, above, I would not guess that I was looking at the Sierra Nevada. This has more of a desert-like, almost Monument Valley, look. Forest walking is cool and pleasant, but there is much to be said for a scene like this, where the farthest mountains are more than 100 miles away. At Carson Pass you will cross Highway 88. 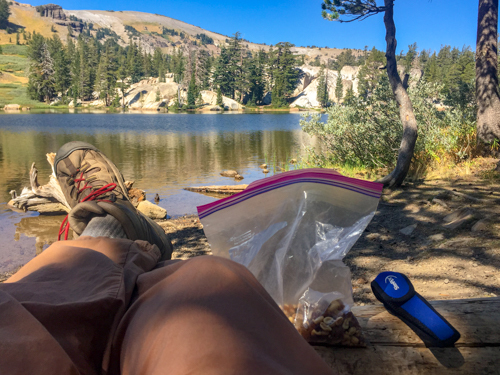 You’ll walk by the Carson Pass Wilderness Center, which is worth a peek into, and has a good break area. (It also has a bathroom in a separate building.) 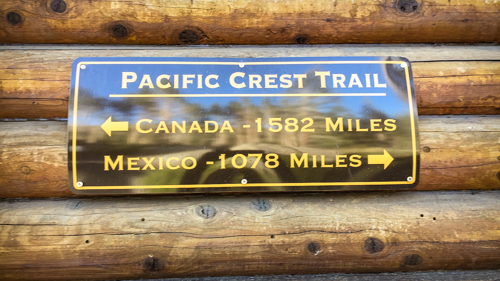 There are also ample reminders that you are on the Pacific Crest Trail, including this sign that informs you that if you started in Campo, you have not reached half way. After crossing the highway and doing a little climbing you will enter a large meadow (labeled Showers Meadow on some maps). This is where I saw an adolescent bear hurrying across to the forest on the other side. The last day begins as the first did, with rolling terrain that progressively gets higher. 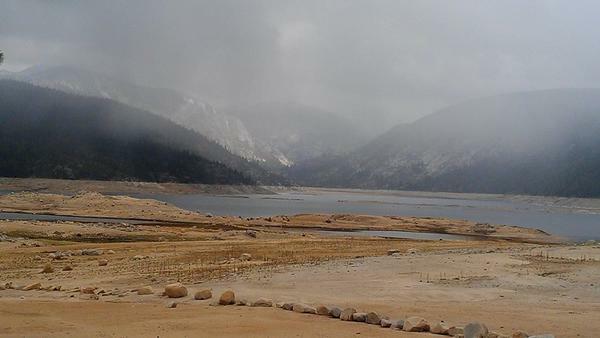 My last break came at Showers Lake, above, where I had some GORP and got my last water for the trip. 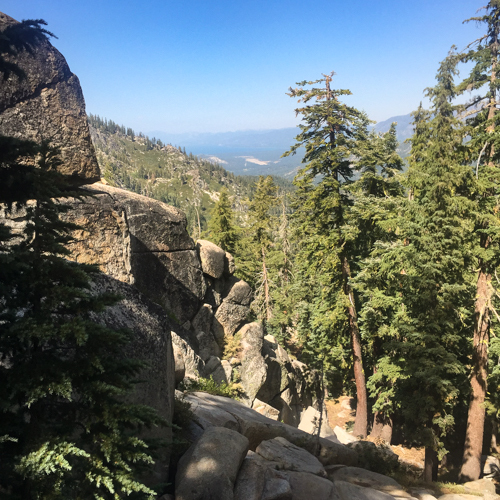 The trip will end with a steep descent of a few miles, during which you will often be treated to views of Lake Tahoe. I hope I’ve given you a sense of this wonderful trek through some terrain that it well worth your time. Next week I’ll talk about where to camp. 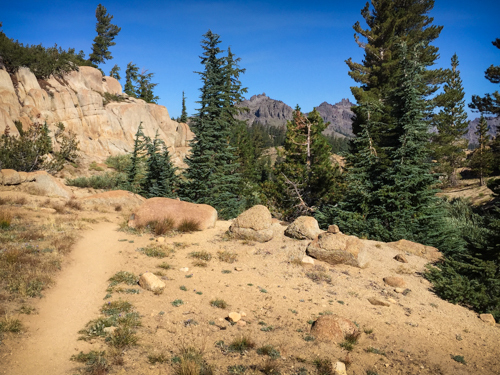 I’ve long been of the opinion that the John Muir Trail represents the best that the Sierra Nevada has to offer when it comes to medium-distance hiking. 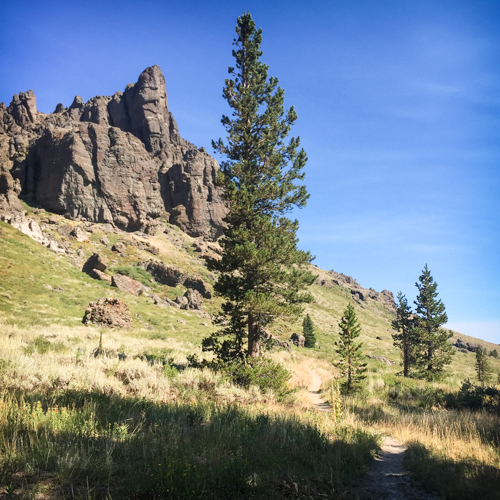 That doesn’t mean it is the only trail that can provide great scenery, easy navigation, and a just-challenging-enough level of strenuousness. 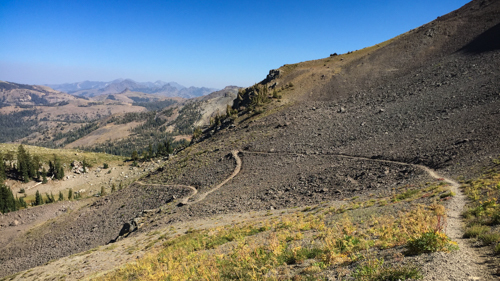 If you are looking for a JMT alternative that has no permit obstacles to overcome, and can be done in three or four days, look no further than an Ebbetts Pass to Highway 50 hike along the PCT. 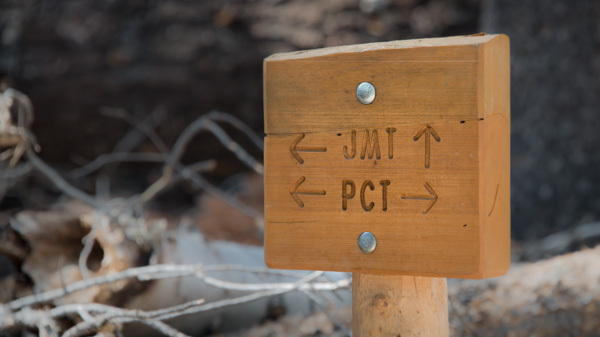 In this three-part series I will try to give you all you need to know to tackle this mini-JMT. In part one I’ll relate the data you need to determine if this hike is right for you. Part two will be a photo-heavy trip report, and part three will describe possible campsites for each evening. The hike is about 42 miles and climbs 6,200 feet (and descends 7,700). 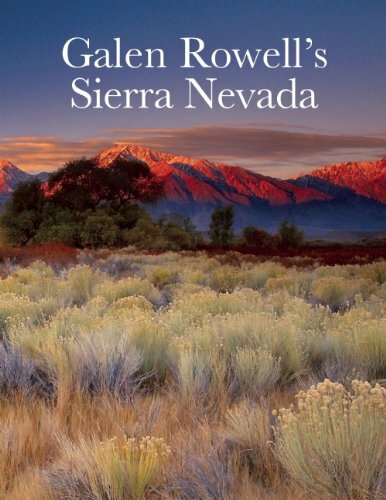 This is the Sierra Nevada, so don’t expect many long, flat stretches. Water, when I hiked it at the end of August after a less-than-average snow year, was plentiful, although I did make a mistake on day one assuming that the lake I intended to camp near had good water. For the first time ever hiking in the Sierra Nevada I found water I didn’t want to drink. More on that in part three. Permitting couldn’t be simpler: at the parking area, just south of Highway 4, there is a kiosk with trail information and a supply of permit forms ready to be filled out. (If you have trouble finding the kiosk, look behind the restroom.) Fill out the form, leave a copy in the box provided, and be on your way. 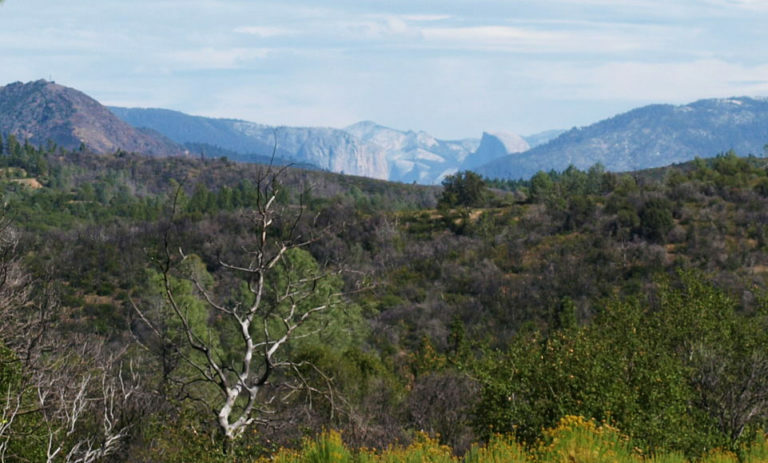 There are two ways to begin: either start at the trail right near where you found the permit forms and walk about 1/2 mile to Highway 4, or jump back in your vehicle and have someone drive you to the trailhead on the north side of Highway 4. 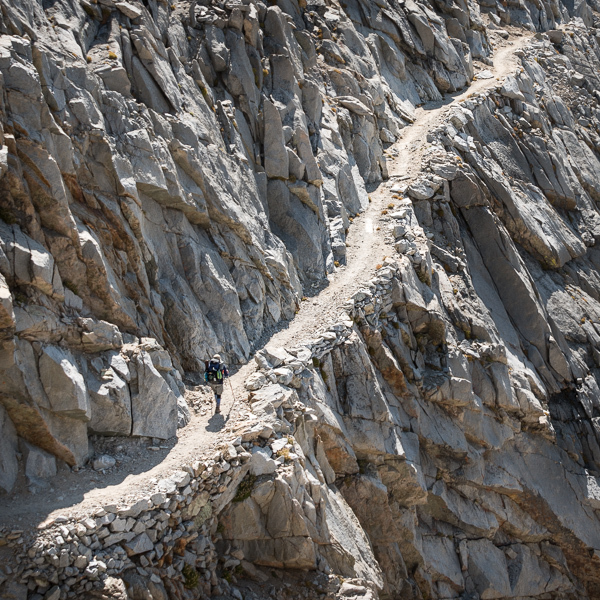 This touches on what is probably the one area where this hike is tougher than the JMT. There is public transportation to Happy Isles (and hitchhiking to Whitney Portal is easy). There is no public transportation of which I am aware on Highway 4; you are going to have to find a ride to the trailhead. No matter if you are coming from the west or the east, the road is narrow, winding, and two-lane (one-and-a-half lane?). Don’t be put off by the road, though. It is in great shape and is perfectly safe if you drive at a reasonable speed. 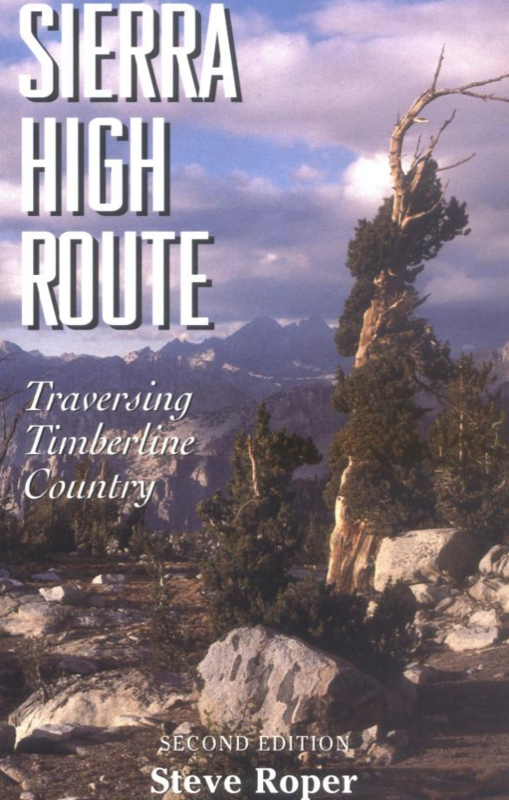 I strongly recommend you hike these 40-plus miles northbound. The last three miles (going north) were tough enough going down; if you were to start in the north, and do this climb first, it would be a beastly way to begin. 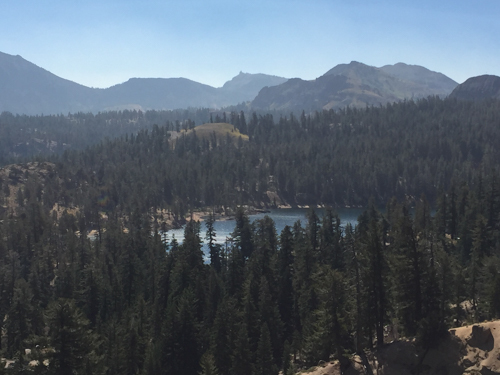 Going north, your hike will culminate near the Adventure Mountain Lake Tahoe snow resort. In fact, the driveway off of Highway 50 into the resort is a great rendezvous spot at the end of the hike. In late August I saw lots of other hikers, but never too many. 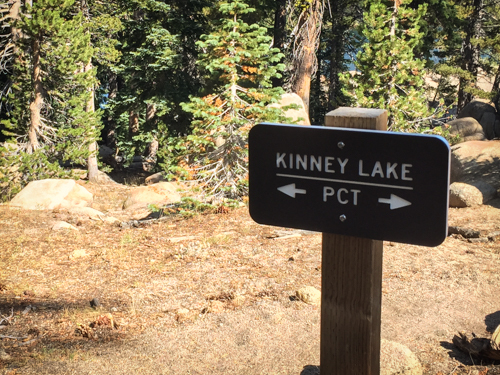 You’ll see day hikers near the beginning and ending trailheads, and where the PCT crosses Highway 88 at Carson Pass. I also met three PCTers who were hiking southbound. On day one I saw about dozen people, day two about half that, and even fewer on day 3. That means there was plenty of solitude. I think most hikers would take between two-and-a-half and three-and-half days to complete this hike. I did it in three days without struggle, and I’m 63 years old. It is a beautiful walk; more on that in next week’s post. 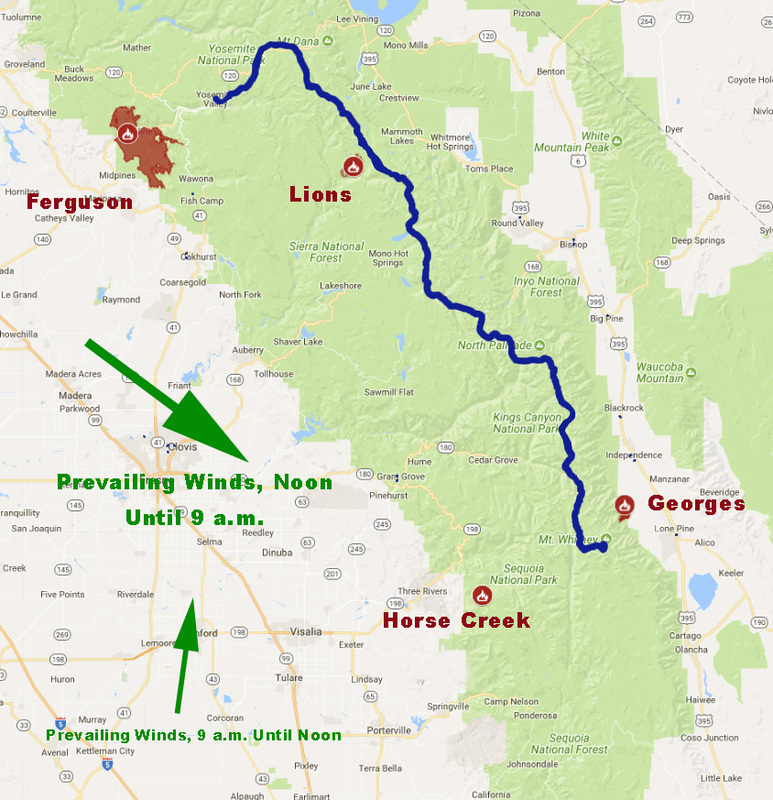 The Rim Fire roils to the north. 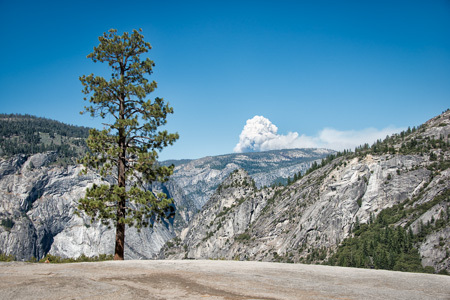 This photo was taken from near Nevada Fall, when the smoke was blowing northeast. 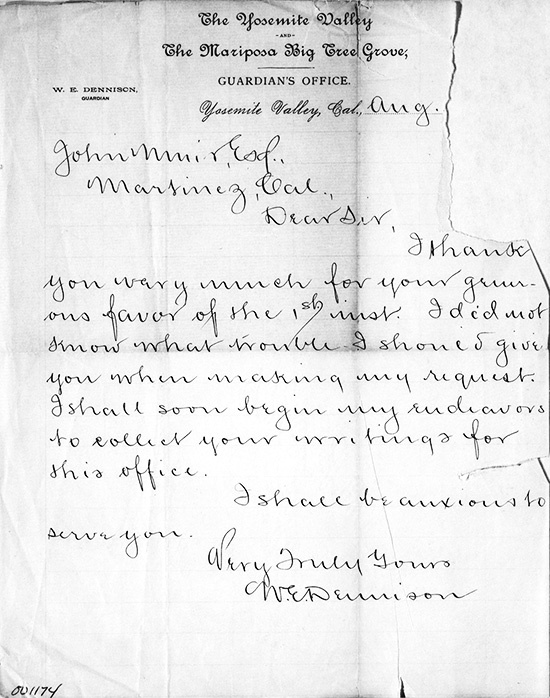 I have long been a proponent of late summer or early fall for a thru-hike of the John Muir Trial. I am close to changing that recommendation. Starting in late August or early September has a lot to recommend it. Most kids are back in school by the latter part of August, and by Labor Day just about all of them are. The deep snow is long gone from the passes. With little snow at the highest elevations there is less water in the rivers and creeks, which makes the stream crossings far less problematic. 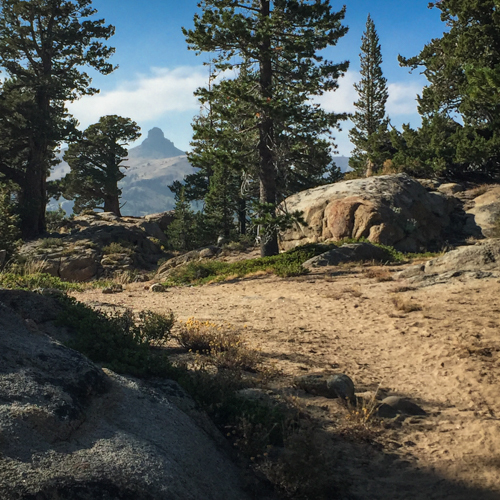 I happen to really enjoy two nights — with a rest day between — at Muir Trail Ranch. One- or two-night stays for a single or a small group are far easier to arrange later in the season. Lastly, I hate mosquitoes. It’s unlikely that you’ll complete a JMT hike in September without seeing ANY of those little bloodsuckers, but you’ll see darned few. That’s an awful lot of good reasons to hike late in the season. Here’s the one disadvantage: wildfires. During previous thru-hikes I’ve encountered the smoke from forest fires that came close to ending my trip. Once, a fire caused me to abandon the trail. The first occurred in 2009. Two days before I started making my way up to Nevada Fall, a “controlled” burn, near Foresta, became anything but. 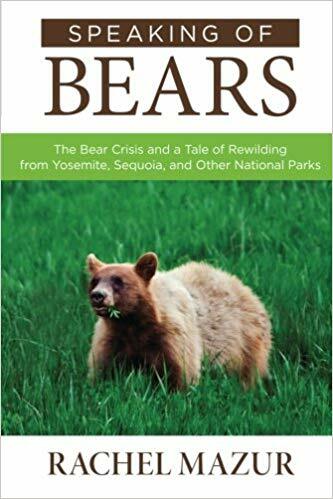 The forest service was supposed to burn ninety-one acres; by the time the fire was out it had burned roughly eighty times as much (nearly 7,500 acres). As I ascended out of Happy Isles the smoke wasn’t horrible, but it was noticeable. 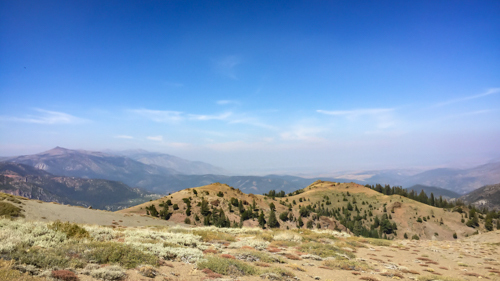 Three days later, while walking though the Rush Creek drainage, I could hear the build-up of stuff in my lungs. Sleeping was particularly unpleasant, as my noisy respiration kept me awake. 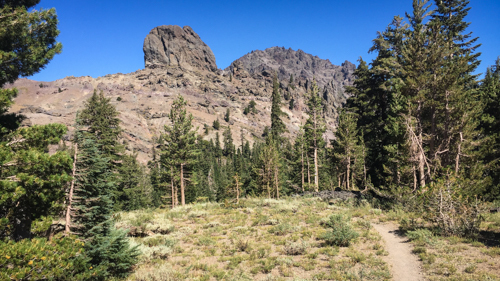 I took an unscheduled rest day at Red’s Meadow and went into Mammoth Lakes to find a doctor. After just one day of some wonderful pharmaceuticals I was nearly 100% and back on the trail. In 2013 it was the Rim Fire. (This fire would ultimately dwarf the fire of 2009.) 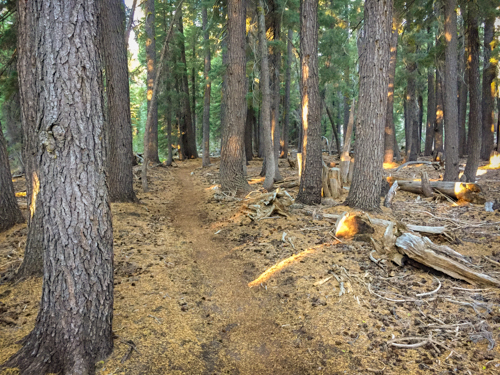 The Rim Fire almost disrupted my hike before it began. 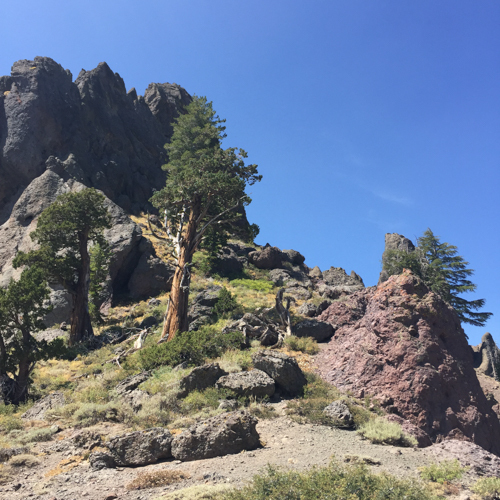 I acclimated in Mammoth Lakes, and if I had waited two more days before taking the YARTS from Mammoth to Yosemite Valley, I would not have gotten through. The road closed about forty-eight hours after my trip. Then, on the fifth day of my hike, the wind changed and all the smoke that had been blowing northeast started to blow south. When I reached the top of Donohue Pass I could hardly see the terrain behind me. I exhibited no symptoms of smoke-inhalation this time, but walking through all that smoke (while breathing hard) just wasn’t much fun. Fortunately, the smoke cleared the next day. Twice more during the next two weeks the wind would change and spoil the air (and the views) during my hike. Each time I considered abandoning the trail if things didn’t improve within a day or two. Each time they did improve. In 2015 it was the Rough Fire. The smoke came and went the first few days of my hike, starting at Glacier Point and exiting Yosemite via Isberg Pass. By the time I made my way down from Silver Pass the smoke had really started to roll in. Halfway to Quail Meadow it was thick, caustic, and causing one of the more nasty headaches I could remember. The views were mere shadows in the nearly opaque gray that enveloped me in all directions. That meant it was no fun walking and no fun looking at the Sierra Nevada. That didn’t leave much incentive to continue. When I reached the bridge over Mono Creek I decided to bail via VVR. This year we are all dealing with the Ferguson Fire. So, is all of this a good enough reason to hike early? I don’t know, but it is something you may want to consider. If you decide on a June or July adventure, just make sure you bring the insect repellant!